I want to improve the exhaust system on our competition Bagheera. The recommendation, when tuning an engine or fitting a supercharger, is to fit a "free-flow" exhaust system. Are any such systems made for the Bagheera? I have heard of the "Devil" exhaust manifold but is it any good? Does it come with a silencer? Cost? Can the exhaust ports in the cylinder head be opened out? They seem very small? 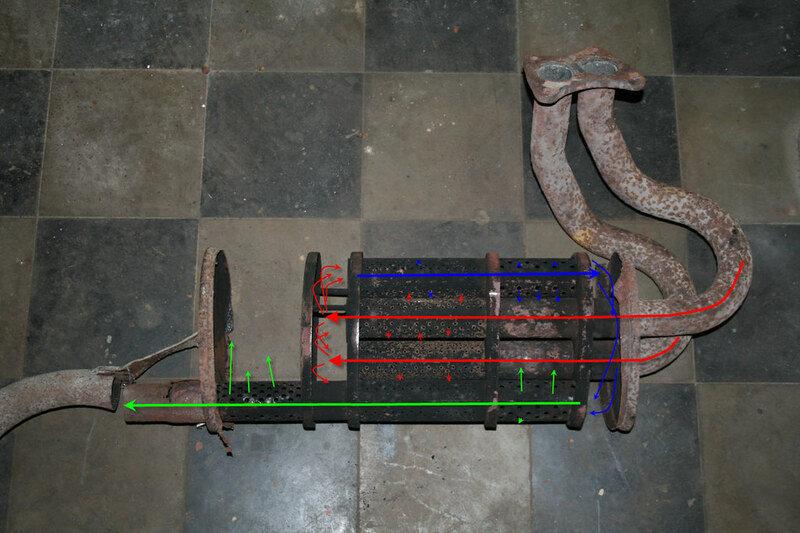 How about taking apart the old silencer, using the two original pipes from the exhaust manifold and fitting two "Straight through" silencers one for each of the pipes? "Cherry Bomb" is one make of straight-through silencers. GBP35 each on eBay. Two separate outlet pipes would be fitted. A competition car noise level is monitored and must not exceed 110dB. Baggy Joe presently is around 97dB even with the supercharger fitted. I had then contact with a member of one of the Italian club who was implied in this story. Not sure of which one. The exhaust ports in the cylinder head can be opened but (at least on an unblown engine) you should not match them with the exhaust. I saw this several times and it's a big mistake to match the opening with the exhaust manifold. 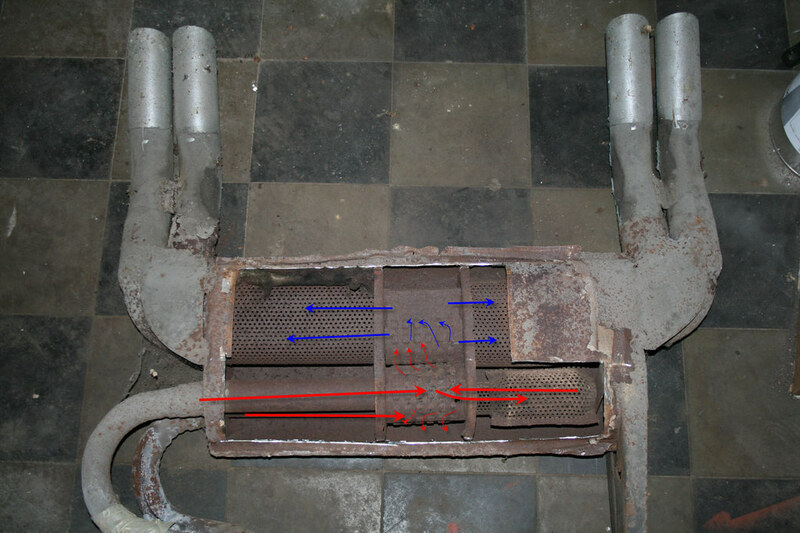 The step has a purpose : acting as an anti reverse for the exhaust gases. If you have a wide band camshaft this is even more important since the unburn gases will be contaminated by the reversing burn gases. I've seen a very open exhaust for Simca rallyes. The IRESA C76. Coincidentally Gerard Magro has just sent to me the photo below of a prototype Matra-Simca engine. The text is just readable but it seems to be a 16 valve head, two overhead camshafts and a very fancy exhaust system! Fuel by injection or carbs! It was intended for the Bagheera and is based, it says, on Matra's V12 head technology. Makes me dribble! There is no date given but it must be mid-1970's? The engine block looks very familiar, flywheel, oil pump and filter etc. I wonder where the engine is now? The Matra Museum perhaps? Drawings? Serious money I ma sure. I am kicking myself for not asking Gerard for more information on his CG-Simca engines when I had the chance last weekend. This is a smaller version of the 16V engine - I found the other great for detail but hard to get an overview. I asked at my local exhaust supplier today about straight-through silencers. They have to supply only EU approved systems but he suggested that I should try "Mr Exhaust" in Reigate Surrey who will make special exhausts. It might be interesting to get a quotation. Spyros... Did you say once that you have an engineering drawing of the Bagheera exhaust ports on the cylinder head? By the way, I pictured this fuel injection Simca Rallye engine. It's not intended for a Bagheera. If you are interrested in 16v, there is another way. You have more than one 16V Bagheera engine?? PS I didn't see the 16V Simca engine pic. Well, about the Rallye 16V Engine, I didn't print them since they were not related to the subject. I'll find them back because some of the details I pictured are quite interresting. Let's call this one Mr Blue. And let's call that one Mr Red. Mr Red is actualy an older built than Mr Blue. - Some things in the oil circuit. If you were interested, I have a custom made stainless steel exhaust from a Bagheera. It has twin outlets and straight through pipes inside. It connects to the standard cast manifold but I am sure that would be easy to change. Let me know and I can take some photos. Despite a day of digging in my parts, I couldn't got hold of this part : not the silent block but the S shaped part going from the silent block to the gearbox. Does any of you have such a part, in order to give me the height ? Spyros wrote...not the silent block but the S shaped part going from the silent block to the gearbox. Is there a part number in the Bagheera parts catalogue or is it a unique Solara part? I presume that the 1600 Murena Gearbox mount is the same as the Bagheera? Did you try it on a car? How noisy is it? Is it a "nice noise"? Geographically, where is it located? PM reply if you prefer! Include your phone number please. Spyros, ref silencer internals and fancy engines! The standard exhaust silencer looks very restrictive! 4 off 90 degree bends at least. Was there some sound absorbing material around the pipes that has been removed for the picture? I have trouble with Flickr - it may be an AOL problem - so I haven't seen your 4 outlet ANSA version yet. The engines are very impressive. Are you still working on the final details? You have done a lot of work already! On the Ansa, there was rockwood around the pipes in the left & right chambers. On the standard one also but only where the pipes are holed. The part I'll find somewhere is not a Bagheera one. The Murena gearbox is a MA, not a BE1. I have 2 MA's and they are known to be weaker than the other one. So the part is not common. It's also a bit more difficult because 1.6 Solara with such a box is very unusual. I don't remember but I think they only produced them over a year. For my engines, still lot's to do. The ANSA silencer still does not look very "straight-through"! What did it sound like? The four outlet pipes must have looked impressive! I did not get a chance to call "Mr Exhaust" today. Perhaps I should call in to their works on my way to collect the Bagheera windscreen on Wednesday.